There are two versions of the CHARM software available; One assumes a single source in flat terrain. The second version allows for multiple sources in complex terrain but requires more input than the first. Both versions are available for downloading for a two week evaluation period on the Downloads page. Registration is required for trial version downloads - no financial information is required or requested if checkout is directly from Your Cart. They both provide calculations of air transport and dispersion, mechanical and vapor cloud explosions, and BLEVE, jet fire, and pool fire radiation. See the Examples page for representative impact results of scenarios calculated using the complex terrain version. The flat terrain version is also available as a web application, which can be accessed through a browser on the Internet and requires no special software to be loaded on the browser’s computer. Both versions of CHARM can be used to estimate impacts from the use of chemical WMDs. The expected species that may be used (e.g. chlorine, mustard gas, sarin, soman, and VX) are in both databases. The complex terrain version can do an even more complete simulation. Many chemicals used for WMD are released as aerosol. The complex terrain version of CHARM is capable of simulating all major processes affecting aerosol. Some estimate of the size distribution of the aerosol in the released chemical is needed. After the release has occurred, CHARM can calculate the changes in the size distribution due to coagulation, condensation/evaporation, and deposition. The aerosol capabilities of the complex terrain version of CHARM also allows impacts from biological WMDs (e.g. anthrax) to be estimated. The impacts can be given as air concentrations or surface deposition. Nuclear Radiation impacts have been added in the Complex Terrain version. Radionuclides can be included in an emission. Radiation rates and doses are calculated - 2D, 3D, and table displays. Complex Terrain version can use multi-processor chips. Faster results! The list with the changes made to the Flat and Complex Terrain versions of CHARM is available here. WebCHARM takes the power of CHARM and delivers it right to the web browser of your choice, no matter where you are. We understand that in many situations, especially in the field of accidental releases, you cannot always be by a computer with the proper software loaded. Because WebCHARM is hosted entirely through the web with no software to download, you are always just a few clicks away from conducting your modeling analysis. Price: $14,000.00. Includes licenses to both flat and complex terrain versions. Multi-license discounts. Short term leases. 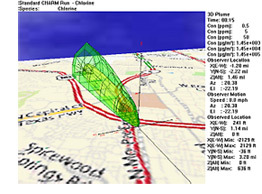 The CHARM® software is an application that calculates the movement and concentration of airborne plumes from released chemicals; thermal radiation impacts from fires; and overpressures from mechanical and vapor cloud explosions. Price: $0.00 An evaluation/trial copy of the software cannot be used for commercial purposes. Full featured complex terrain version - Two week evaluation copy. Version (not time) limited KEYS provided BEFORE September 19, 2016 will NOT WORK. Updated April 11, 2019. Full featured flat terrain version - Two week evaluation copy. Version (not time) limited KEYS provided BEFORE September 19, 2016 will NOT WORK. Updated July 1, 2018. Price: $2,500 - $7,500. Two to six month license for use of both flat and complex terrain versions. A short term lease for the CHARM® software application that calculates the movement and concentration of airborne plumes from released chemicals; thermal radiation impacts from fires; and overpressures from mechanical and vapor cloud explosion. WebCHARM is the web application of the flat terrain version of CHARM. It provides for the most used functions of the model.